Blue lipstick, a tutu, drool, and a glowing eye. I think that title just about covers it. Honestly, sometimes the hardest part about posting a blog is thinking up a title. Anyway, on to the randomness... To help me get through the long winter here in Idaho, I joined a local gym. My priorities in joining went something like this 1) It has a nursery 2) It is something to do that is not wandering WalMart 3) Did I mention that I get away from the bundles of joy? 4) Maybe I will get some exercise. Maybe. Anyway, the ladies that watch the kids there gave them all little stockings with some small gifts for Christmas. Alex was very excited about her "sock", and even more excited when she realized that the play cell phone actually contained makeup. 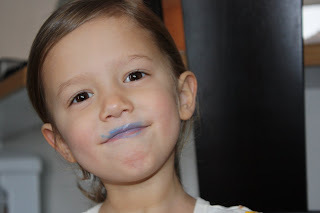 I was less excited about that, especially when I saw that the lipstick was blue and rubbed off on anything it touches. 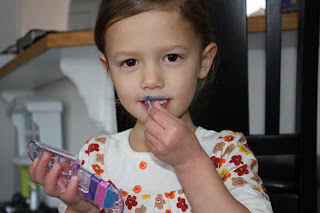 We now have a rule that the lipstick is only applied right before bathtime, when it is promptly washed off. I'm no fun at all, and that's okay with me. I still let her do her own hair...when we're staying in the house, of course. 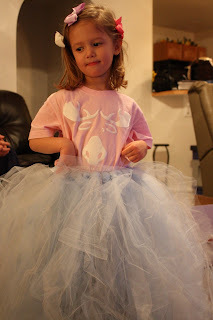 And check out the fab tutu my friend Jen made for Alex. Too cute! 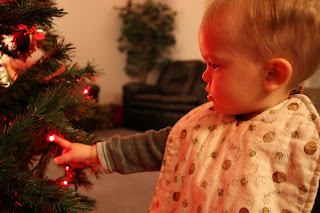 Here's the little guy checking out the lights on the tree. 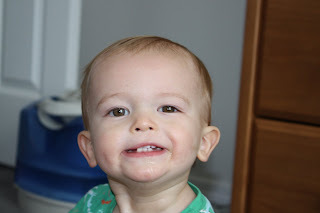 And if you're wondering when he's going to stop drooling so he can stop wearing bibs 24/7, so am I. 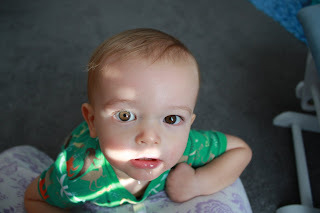 He has a special ability to make one eye glow. 2 days 'til Christmas-- get wrapping!! Last Sunday was the preschool Christmas program at church. Alex was a sheep and the show was a hoot. There were kids picking noses (and eating the proceeds! ), waving to mom, asking for a drink, exiting the stage in tears, and all sorts of unplanned fun. Here are clips of our sheep that you will probably only enjoy if you are Alex's grandparent, so I forgive the rest of you for bowing out now. You can't see Alex in this one because she is standing right behind a non-moving/singing shepherd, but I thought you'd like to see the circus atmosphere on stage. They made Jesus work at a young age...he was barely born and he's already sweeping! Good try guys, now let's have Alex take her finger out of her mouth, and Derek stand up next to sissy. Almost, but this time don't fall over. Ummm, can you stop crying for a sec? No? So we decided to head over to the church and try to snap some pictures there. Maybe he would be in a better mood then. Here we are before the service started. Right, okay. So Alex, stop jumping. And Derek, for the love of all that is good, will you stop crying?? No? Okay, so let's go to the service and we'll try once more afterward. I think Alex was getting a little frustrated with him. And poor Derek, well, he was just not having his finest moment evening weekend. This was the best we could come up with, but their faces are kind of washed out and Derek wasn't exactly looking at the camera. So this year we will have 2 individual pictures on our card and you know what? I think it will be okay. The good news is that mommy's Christmas present arrived in the mail this week and hopefully next year we will have a much better time! I got a new camera which I am so excited about and the instruction manual guarantees that it will make me an awesome photographer. Oh wait, I guess it didn't technically say that, but I'm sure that's what will happen. Surely by next Christmas, right? So what is the age when you should give up on naps? Alex has never been a great napper, but she is fighting it now more than ever. These days I usually require her to stay in bed for 20 minutes or so before letting her get up and play quietly in her room. Of course, my idea of quiet is a little different than hers. However, I'm always interested to see what she's been amusing herself with when I let her out. For instance, this day I opened her door to a fairly typical scene. She almost always builds a block tower for her brother to knock over when he wakes up. But this day I could hear her singing, but couldn't see where she was. I thought maybe she had crawled under the bed. Nope, I was wrong. She was sitting in the hamper with her dirty underwear. Then the next day, she came out wearing this lovely ensemble. Yesterday during quiet time she decided her green jammies needed a pink sweater to complete the look. And then she decided her brother needed some milk. Hope that's soy, Alex! It was cute though to overhear her saying "Here, drink your milk Bubs." Derek, aka Bubba, Bubs, Derry-Boy, Mister Man, and Bug, responds equally well to all his nicknames. And is just about the sweetest thing ever. Oh, and to all of you crazy folks commenting on my last post...just because I'm sad that my baby is growing up does not mean that we're having more! ;) I think our little family is complete. 99.9% sure. Okay maybe just 99.8%, but still, that's pretty sure. I love the way Derek is nodding "yes" these days, so I thought I'd get a clip of it. And holy cow is that ever a big head! I'm suprised his nod doesn't throw the rest of his body forward too. I meant to post this clip earlier, but guess I missed it. It pains me to see how my baby is turning into a little boy!